We have stayed in this apartment in the beginning of March. In general the apartment was nice and clean. You could find almost everything you need there for living. I have been contacted by the host before arrival and during the stay, so it was good to be not forgotten. There was the detailed instruction sent in advance about how to get to the appartment and other important staff. The beds were quite big, so we could easyly fit there together with the 3 year old child. Our hosts Maria and Marios were extremely friendly, helpful, answered all our questions and fulfilled our additional requests. 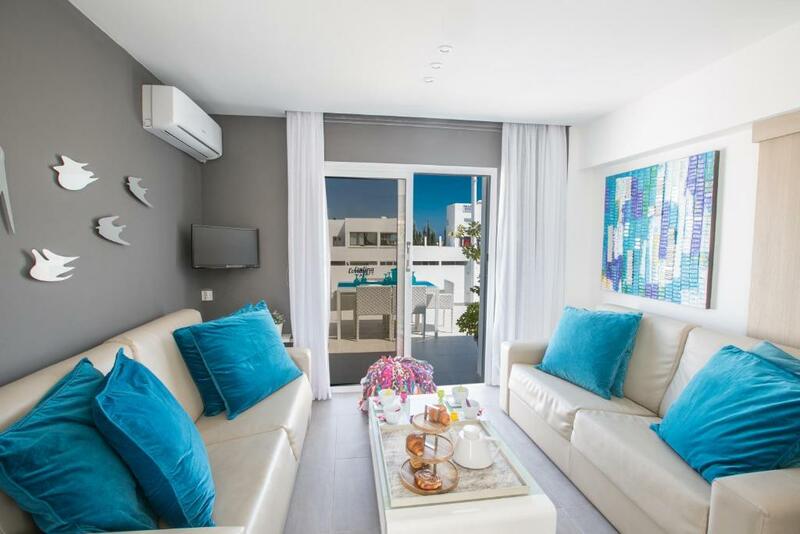 The apartment is just perfect - is nicelly arranged, comfortable, has a convenient kitchen with everything that you need to cook yourself, has a big terrace and is situated on the main street with lots of shops, restaurants and 5min walk from the beach. Bus stop is just in front of the house, where from you can get to Ayia Napa, Larnaca and other cities by public transport. Thank you Maria and Marios - we had fantastic vacations! Looking forward to coming back! Everythink was very nice.thank's a lot Maria.she was very kind. Everything near the property restaurants, farmacy, bakery, cafes, pubs, mini markets !! При заезде очень приятным бонусом были 2 бутылки охлажденной воды, сок, кофе и чай. Большое спасибо! Все чисто и аккуратно. Посуда и техника в хорошем состоянии, белье и полотенца чистые. Моющее средство и губка для посуды есть. Фен, гладильные принадлежности. Супермаркеты в шаговой доступности. Апартаменты находятся близко к морю. С пятилетним внуком доходили за 5-7 минут. В Протарасе отдыхаем второй раз. И думаю, что приедем с внуками еще не один раз на эти шикарные пляжи, отличный променад вдоль моря... Но данные апартаменты подходят только для взрослых людей и детей более старшего возраста. Хозяева высылают подробную инструкцию как получить ключ. Квартира просторная, с двумя большими террасами (над столом натянут навес, можно отдыхать в тени даже днем), не душно даже в жару. Очень близко к лучшему пляжу Протараса - Фиг три бэй. В каждой комнате по кондиционеру. Чисто. Много посуды и кухонной техники. Рядом большой супермаркет. Здесь же начинается променад с кучей магазинов, ресторанов и т.д. Отлично работал интернет. Есть сейф. В спальне 2 полтораспальные кровати, мы с двумя детьми отлично на них размещались. Даже не воспользовались раскладным диваном в гостиной. Очень удобное месторасположение, 5 минут до самого хорошего пляжа Протараса. Все! Наличие огромного балкона, под которым находиться заведение и частенько играет живая музыка. Наличие второго балкончика что-то вроде сушильной комнаты на свежем воздухе. Полноценная кухня со всеми необходимыми вещами. Расположение до моря 7 минут медленным шагом. В принципе удобное расположение относительно прогулок до центра, не очень то и шумная улица по сравнению с более центральными. Магазин Best Buy в 3 минутах от апартаментов. 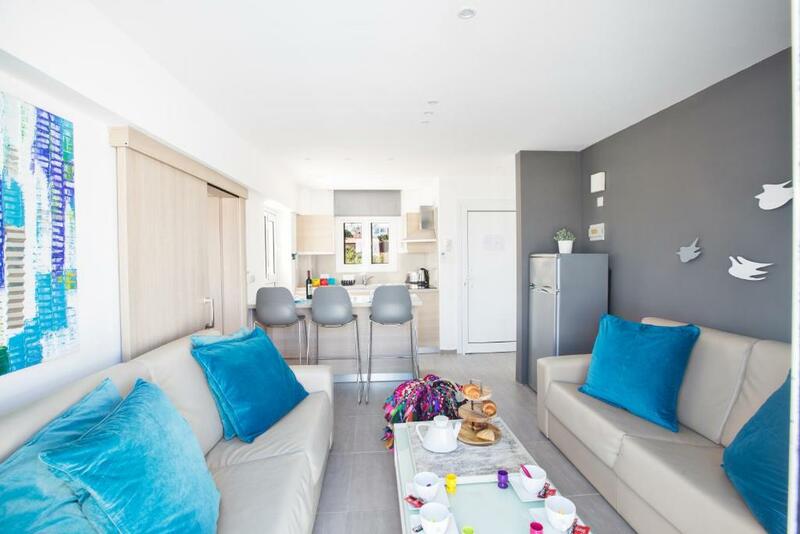 Lock in a great price for Evelina Apartment – rated 8.4 by recent guests! One of our top picks in Protaras.Centrally located in Protaras Town, Evelina features modernly decorated apartments with a spacious balcony. The beach of Fig Tree is just 500 feet away, while bars, shops and restaurants can be reached within a short walk. All air-conditioned apartments consist of a separate bedroom with dark-wood furnishings and a private bathroom. The kitchen corner comes with a stove, fridge and dining counter. A flat-screen TV is available in the seating area. 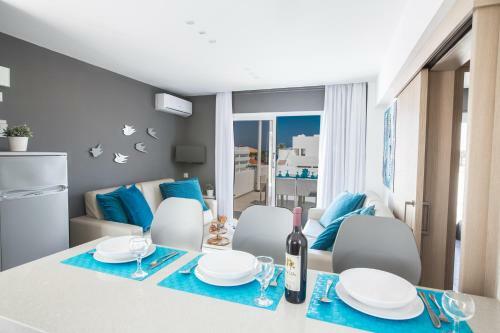 Evelina Apartments lies 6.2 mi away from the lively town of Ayia Napa. Larnaca International Airport is 35 mi away. Free parking is provided on site. 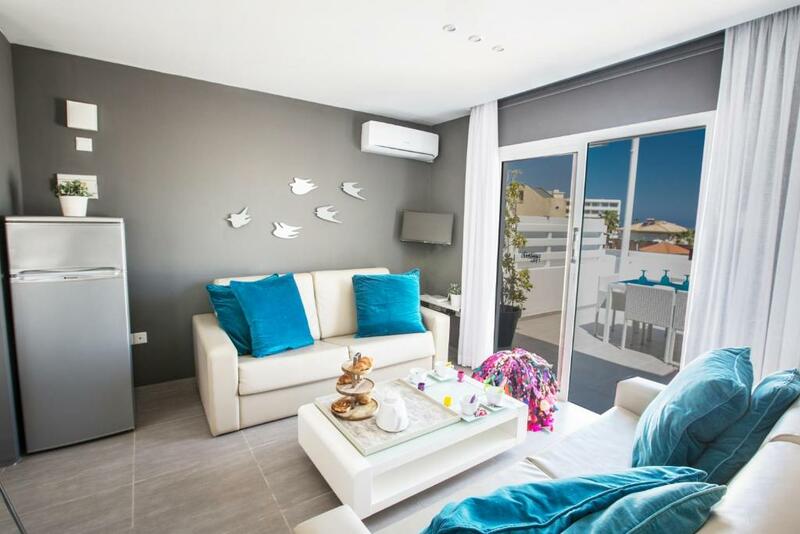 뀐 Located in the real heart of Protaras, this property has an excellent location score of 9.0! When would you like to stay at Evelina Apartment? 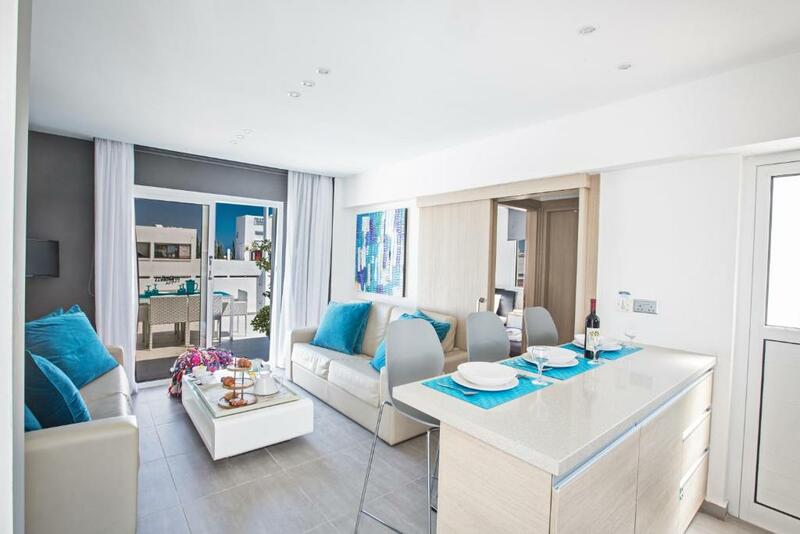 Modernly decorated apartment opening to a spacious balcony with dining table, just 492 feet from the beach. 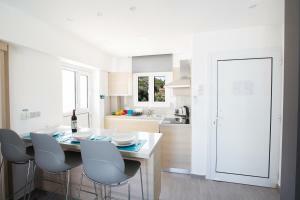 It consist of a separate bedroom, fully equipped kitchen corner with a dining counter, and a seating area. Air conditioning and a flat-screen TV are included. 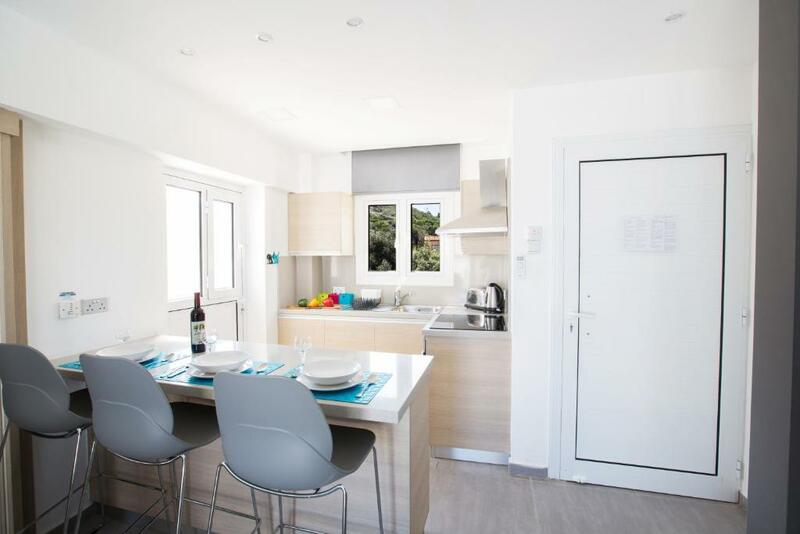 This beautiful New full modern renovated one bedroom, partially air conditioned apartment, is located at the Square in the heart of everything. 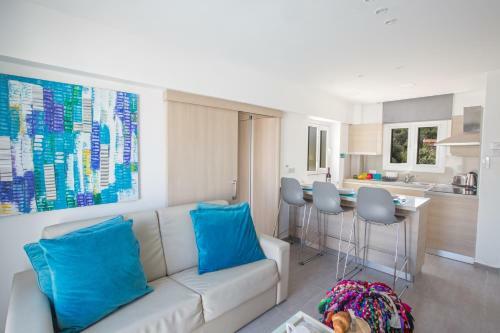 The apartment is close to many cafes, bars, restaurants, shops, boutiques, department stores, supermarkets and 2 minutes walking distance from the 9th best beach all over the world (Fig Tree Bay Beach). The apartment sleeps up to 4 people. It has one bedroom with two single beds, 2 additional sofa beds in the living room and 1 bathroom. 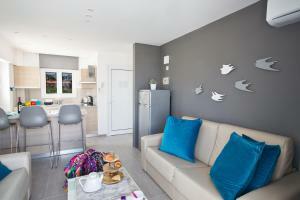 It has a fully equipped kitchen and features various amenities, such as free Wi-Fi. The outdoor area opens onto a huge veranda. My name is Maria and I am the owner of Evelina Apts. For the past several years I have worked in a managerial role in a property development company. For five years now I control the management of the properties. I have excellent communication skills a friendly personality and plenty of customer service experience, including the ability to communicate with customers clearly and politely. I am organized and willing to accept responsibility for meeting deadlines promptly. My educational background includes Computer Science. I love to offer hospitality and care to my clients. House Rules Evelina Apartment takes special requests – add in the next step! Evelina Apartment accepts these cards and reserves the right to temporarily hold an amount prior to arrival. Please note that 7 days prior to arrival, guests will receive an email including instructions on how ti get to the accommodations and how to pick up their key. Not informed before arrival how to get to the apartment. Not responding to messages sent prior to arrival. Not being informed before arrival that there is a building site across the way that operates from 7am to around 8pm, 7 days a week. Host Marios couldn’t see why that mattered. Agreed to resolve the issue by offering 50% on accommodation for another holiday but could not accommodate our dates. Then went completely silent. Parking is hit or miss 24 hours a day because it is used by every man and his friend, even the space that is marked. Marios didn’t seem to have any interest in sorting this out. Sunbeds were only provided after we insisted even though they are on the booking.com photos. Bathroom is a danger zone as water from the shower floods the floor and makes it slippery. Most balcony doors were of very poor quality and did not always lock. One was obviously forced open in the past. And as you are above and near 2 restaurants, be prepared to have a fumes filled apartment and the restaurants undergoing intensive repairs and upgrades. Sink in kitchen not secured. Sink, bath and basin plugs not fitting properly. Safe batteries were covered in battery acid and had to replace. I hope booking.com can intervene. We have chosen this apartment because of the location and terrace. We were planning to eat outside all the time-this was really top priority for us. Unfortunatelly we were surprised in a negative way-in front of the terrace there was a huge cosntruction works going on. They were starting in the 7 am and working until 7 pm even on the weekend! We could not get appropriate sleep, we could not enjoy the silence, we could not use the terrace and even to open the windows-it was so loud and dusty! I would expect the Host to inform us in advance about this happening in front of the appartment, but they did not...unfortunately. And no any compensation for this. Also I think it is time to change blankets and pillows-as they are yellow from sweatting. Aircondition switched off automatically after 4hrs.